Rusk Deep shine oil smooths the cuticle, eliminates frizz, and imparts incredible shine and condition. Lightweight with brilliant shine. Made with Pure Argan Oil. Improves elasticity. Improve hair's condition and add shine with Rusk Deep Shine Oil Finishing Hairspray. • Enriched with marine nutrients and pure argan oil, to help improve hair's condition and impart shine. • Quick-drying ultra-fine mist that locks style into place. 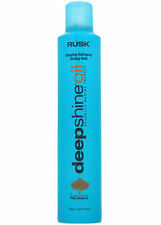 Rusk Finishing Deep Shine Oil Advanced Marine Therapy with Argan Oil Hairspray. DEEP SHINE OIL. 4 oz (118ml) - 1 bottle. 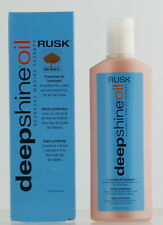 RUSK Deep Shine Oil. oz or 118 mL. Smoothes the cuticle for silky, conditioned and healthy-looking hair. We specialize in hard to find and discontinued product lines. WE BUY FIRST PICK INVENTORY ALL YEAR AT LOWER THAN SALE PRICES! You may also be interested in. Sizes : 4 oz 118 g.
NET WT 4oz. ADVANCED MARINE THERAPY. DEEP SHINE OIL. MADE WITH PURE ARGAN OIL. Rusk Deep Shine Oil Moisturizing Shampoo 8.5oz NEW! The lightweight alcohol-free formula imparts brilliant shine, while marine therapy conditions hair. IT WILL GET THERE. IT DOES TAKE ABOUT 6 TO 7 WEEKS! The lightweight formula imparts brilliant shine, while advanced marine therapy infuses the hair with superior condition. Traditional aerosol hairsprays can be drying to hair. Hair remains soft and touchable rather than rough and/or dried out. • Enriched with marine nutrients and pure Argan oil to help improve hair’s condition and impart shine. Pure argan oil protects color-treated hair for high-impact, long-lasting color that shines with brilliancy. Nourished, lightweight hair never shined so brightly. Regardless, they still utilize a team of talented artists from the hair industry as well as TV and film. Free of sulfates, the shampoo penetrates deep into the hair’s fibers while remaining safe for color-treated hair. We are very serious against false claims. Any attempts with intend to manipulate our system will result in appropriate repercussions. Provides weightless conditioning while enhancing body and fullness. Safe for color-treated hair. Burndy Smartvise Cutting Fixture, Safely Cut Piping, Conduit & Studs Anywhere. We constantly monitor activity on this account and will respond as quickly as possible.